sock prØn. : Knit and Crochet Show Spring 2006, the second. Knit and Crochet Show Spring 2006, the second. I couldn't help myself, the market being so close to me and me with an empty Sunday and the possibility of more than yarn. I headed back to the show, had the best time in ages (notwithstanding the fact the yarn was the same as it was on Thursday), and wish I could be so free to go out like this all of the time. I also bought the "sunburst sling bag" pattern from JustOneMoreRow.com -- and 3 balls of sari silk from YarnPlace.com ($6.50 for the pattern, $6 each for the sari silk on sale-- on Thursday it was $8). 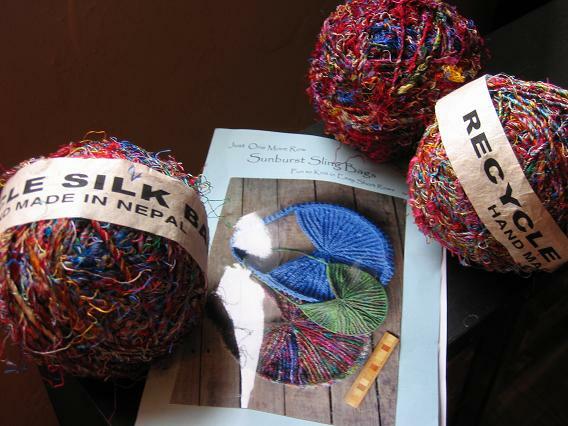 The sari silk is soft and quite pretty, and heavy-- the balls are 8 oz+ each, enough for a large size sling bag. My progress on the sunburst sling bag-- 2 triangles of 10. Two of the sari silk balls are very similar in color where one is more blue/red, so I think I'll stack the triangles like this: light 1 - red - light 2 - red - light 1 - red - light 2 - red - light 1 - red ... same with the other side, assuming I have enough red... never seem to have enough red. I'm to the point where I need to start a new triangle, so I'm going to weigh the ball before & after to guesstimate how much each takes and make sure this works out. I started and frogged a hat from the Colinette Skye from my earlier jaunt to the KaCS market on Thursday; I used Marnie MacLean's Nautilus hat pattern with eyelets, and its huge. Huge even for my head, and certainly huge for my mom's head (who has a somewhat smaller head than me, but bigger hair.) I didn't get gauge (4 sts/inch)... instead I got 5.5sts/inch on US 7. So I decided to make the large size... eh, no. I was almost done and had to frog the whole thing. No matter, its a quick easy knit and I'll restart it as soon as I stop being so mad at myself for never being able to knit a proper hat. I also knit it on dpns, which was far less awful than I thought it would be... Marnie's pattern is a top-down one (one of my requirements, since I wanted to make a longer hat and didn't know how far the yarn would take me), so working the circumference on a small # of sts and then working up is far easier than the time I tried to knit a hat on dpns from the bottom up (& quit and went on circs instead). Back at the market, I went to see all of the booths again but nothing grabbed me as "essential". I did spend quite a long time at the Interlacements booth, sorting thru their specials table-- sometime between Thursday and yesterday they added a whole bunch of "Northwest territory" yarn (mohair, acrylic, weird twisty looking yarn) to the table and as I was looking for that unfound, extra grey skein of Merino Worsted under the acrylic pile (and any other superwash that may have grabbed my attention), another shopper looked at me and said I radiated calm. Heh, I told her it was being surrounded by all of the yarn, since I couldn't say I was drunk on conversation. 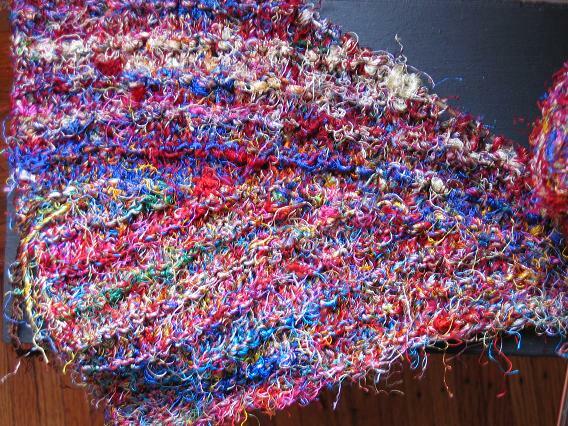 I've looked at that recycled sari silk on eBay before and wondered what I could make with it. That bag pattern is really neat. Can't wait to see it finished! I kept my cool at interlacements and Carolina Homespun, though. That bag is so cool, can't wait to see it finished. Lovely Aussie yarn!! I bet it'll dye nicely too! 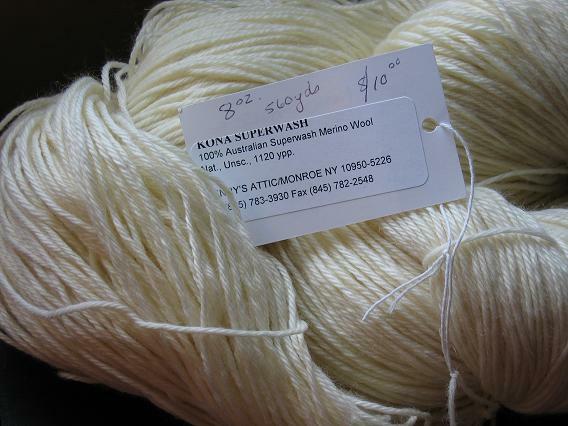 AWESOME price too~ some nicely spun yarns too...... can't wait to see your finsihed bag! Very cool bag! I can't wait to see it finished!